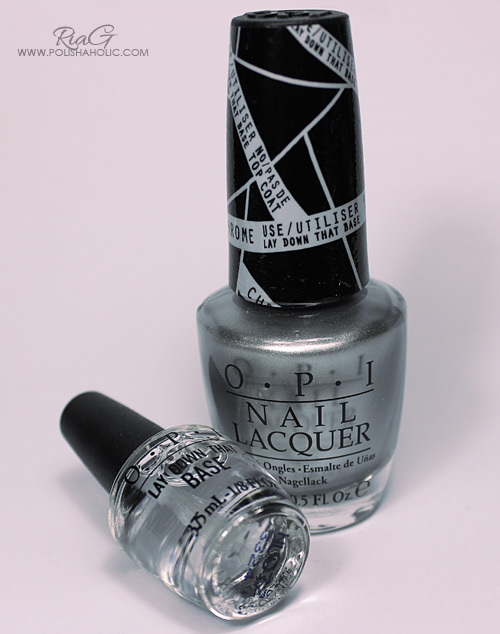 OPI – Where Did Suzi’s Man-Go? Today I have two OPI posts coming up and tomorrow I’ll show you two Delush Polish glitter toppers layered with these pretties. So let’s start with Where Did Suzi’s Man-Go? A gorgeous bright mango creme from OPI Brazil – Spring/Summer 2014 collection. I LOVE this shade! Looks like it’s full of summer and sunshine! Absolutely gorgeous! Formula is great too. Application is nice and smooth. This is two coats with HK Girl top coat. ***Where Did Suzi’s Mango was sent for review, HK Girl was received as a gift. Categories Creme, Nail Polish, Nails, O.P.I. OPI Alpine Snow is your basic white creme. I didn’t use to like all white nails on myself but with this length and shape I actually like it quite a lot. White/very light cremes can be a nightmare to apply sometimes but this one is actually pretty decent. A little streaky on the first coat but evens out nicely on the second. You should take a good amount of polish on the brush. If you try to apply this too thinly it’s going to look uneven for sure. This is two coats with HK Girl top coat. ***Alpine Snow and HK Girl were received for free. I don’t benefit from clicking any of the links on this post. This is OPI Live.Love.Carnaval from the gorgeous Brazil collection. Stunning bright coral creme with great formula and good application. For this manicure I used two coats of Live.Love.Carnaval with HK Girl top coat. ***Live.Love.Carnaval was sent for review. HK Girl was gifted to me. I don’t benefit from clicking any of the links on this post. 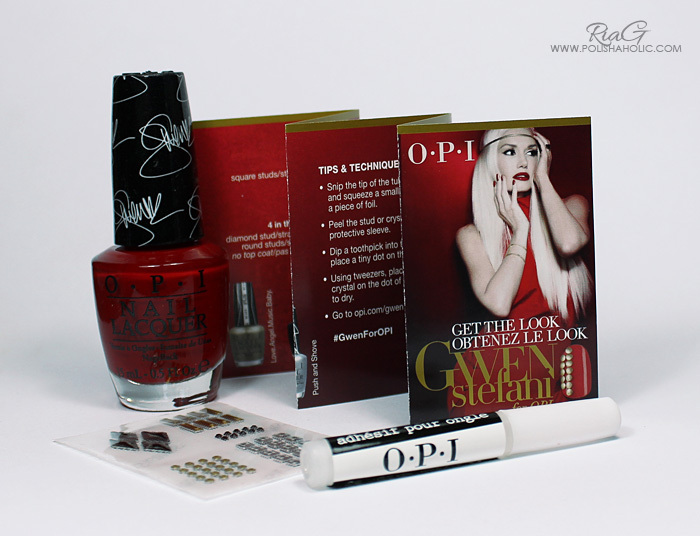 I was so excited when I first saw the news about Gwen doing a collection with OPI. I’m a huge Gwen fan and this collection just makes me so happy :) I think this ended up looking a lot like Gwen. It’s a solid and stylish collection. All the polishes go together really well and there’s a countless amount of combinations for nail art designs. Just Perfect! All these polishes applied perfectly and were opaque in two coats. All of the cremes and In True Stefani Fashion have a top coat on them. HEY BABY is a gorgeous bright pink with a hint of raspberry in it. It’s fresh and not too in your face color. Perfect for summer! I SING IN COLOR is a very deep dark red polish with some chocolate shade in it. You can see the wine-ish red much better with just one coat but this requires two to be completely opaque. I have quite a few vampy shades in my collection but not one just like this. Very pretty! OVER & OVER A-GWEN is a classic bright red. As many others have said Gwen collection has to have a bright red polish in it. This beauty comes in it’s own collectors box with some Swarovski studs and crystals, a nail glue plus instructions and tips for some nail art using the polishes on this collection. I love red nails! I have a lot of red nail polish and this one is now the queen of those reds! IN TRUE STEFANI FASHION has square and hex silver and holographic glitter on a clear base. This one is quite packed with glitter so only one coat is enough if you want the base to show through. On the photo I have one coat over I Sing In Color. Very pretty and sparkly! 4 IN THE MORNING is a black satin matte with subtle silver shimmer. I love the velvet-y look this has but if it isn’t for you no one is telling you not to add the top coat for shine. LOVE.ANGEL.MUSIC.BABY. is a gold satin matte. I really like this one! The gold tone in this one is also so neutral that it’ll go well with a lot of different skin tones. Very beautiful!! PUSH AND SHOVE is a gorgeous silver chrome polish. Very shiny, almost mirror like finish. This one will only work with the Lay Down That Base base coat that comes in the package. Apply the base coat on clean nails and let dry for two mins. When applying Push And Shove you need to be quick and careful. Don’t go over the same spot twice since that might cause balding and dragging of the polish. Let the first coat dry well before applying the second. Don’t pay too much attention on the visible brush strokes or try to fix them by going over them again. Most of them will disappear on their own when the polish dries. You are not supposed to use a top coat with this polish. In real life this looks awesome! So shiny! It worked great with my nails and UV-gel layover I have on them. On natural nails the shiny finish will make the tiniest flaws on your nails very visible so you might want to buff them a bit before using this polish. OPI says this is only meant for one night use. I also have to mention that over the UV-gel this also worked without the basecoat. I didn’t see a noticeable difference between the nails with the base coat compared to the ones without. It also stayed looking perfect for the 24 hours that I tested it. So how do you feel about this collection? Have you bought any of these polishes yet? 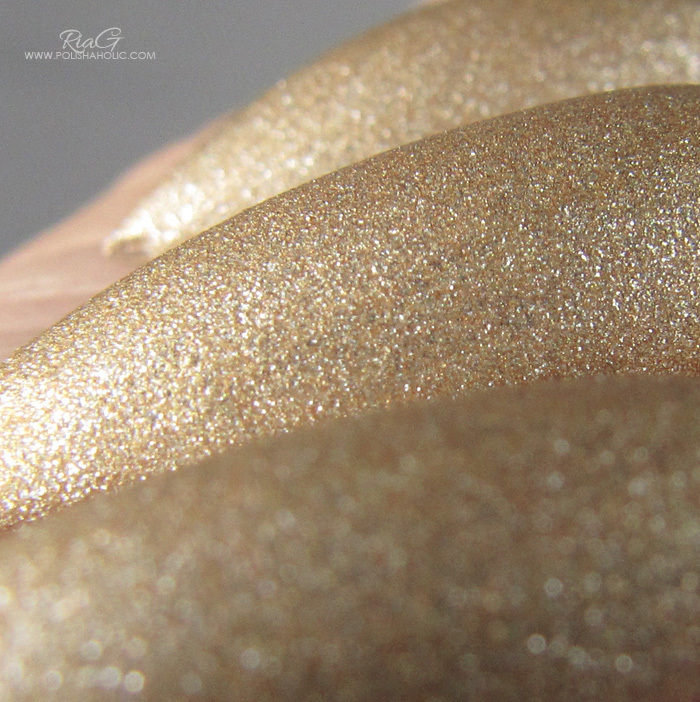 When I saw the first swatch photos of textured sand-y looking polishes I thought they definitely aren’t for me. Then I tried one and I fell in love. There’s so much variety on these that you don’t get tired of them immediately either. Different brands, blingy, matte or glittery finishes. Even the roughness of the finish/texture can be different. 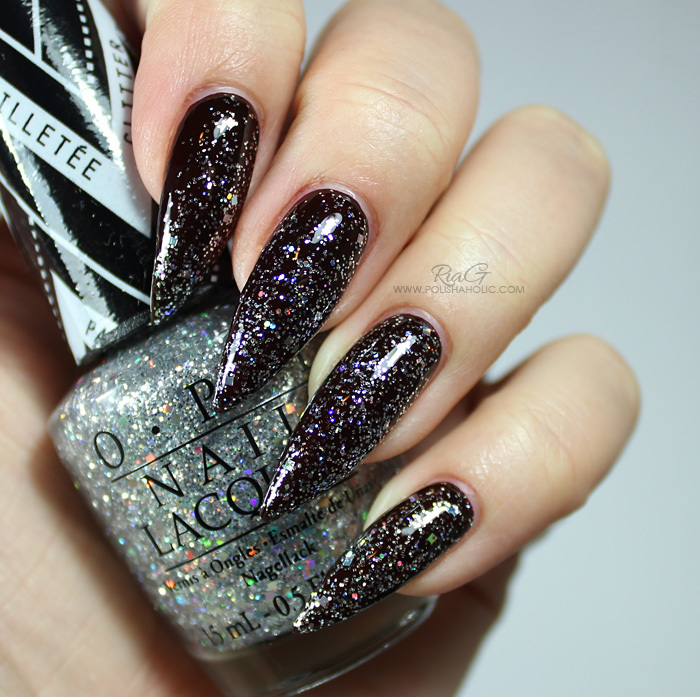 This time I used OPI Liquid Sand Emotions from the Mariah Carey Holiday 2013 collection. 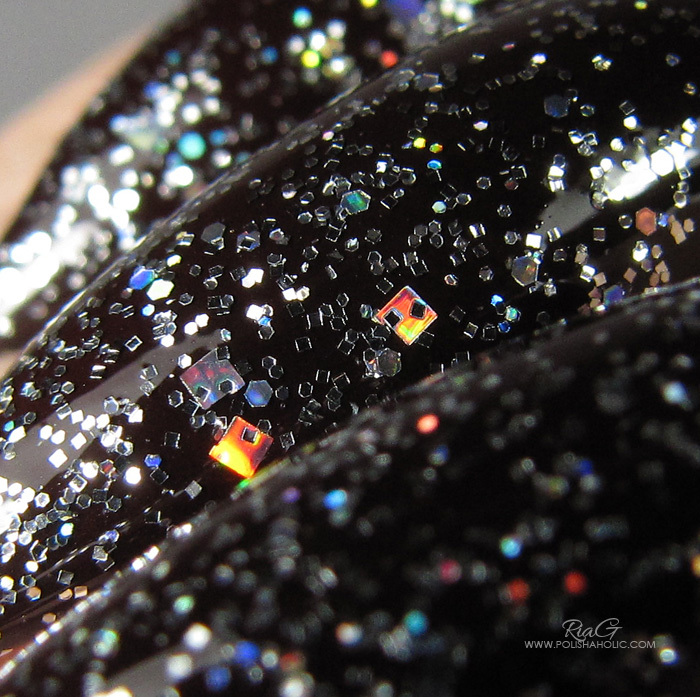 Black liquid sand with black glitter. Very elegant and beautiful shade. Easy application and two coats was enough for an opaque result. With the first coat this seemed quite sheer but the second coat gave perfect coverage. This dries quite rough, but not annoyingly rough. The texture brings certain softness to the black polish and in a dim light my nails even looked velvety smooth. ***Emotions was sent for review. I don’t benefit from clicking the link on this post. I just had to test out the new camera even if I have really no idea how to use it properly ;) Either way I managed to take a photo with the camera’s auto-settings. I think I’ll be using the auto-settings for now and learn more as I use it. 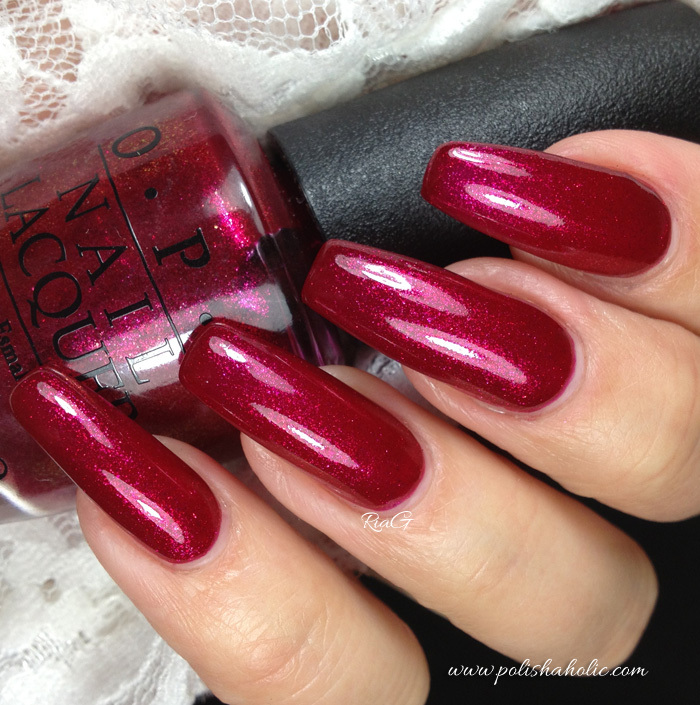 So this is one of the new OPI Liquid Sand polishes for the Mariah Carey Holiday 2013, Make Him Mine. This is a beautiful rosy color that is actually a bit warmer IRL than it looks on my photos. Very sparkly and pretty! For this mani I used two coats of Make Him Mine, no undies (no need cos I have the UV-gel layover to protect my nails) or top coat. The formula on this was very good. Like all the Liquid Sands I have tried this applies easily and perfectly. Two coats was enough for opaque result and the dry time was quick. Removal process was also quite easy compared to your regular glitter polish. ***Make Him Mine was sent for review. I don’t benefit from clicking any of the links on this post. I’m starting a new theme post series on my blog. This might not be a weekly thing but every now and then these posts will pop up. For “Oldie but Goodie” posts I will go through my stash and pick a polish that isn’t untried but has been forgotten for quite a while and deserves to be used again. This way I’m trying to get a little more use out of my evergrowing stash and not just use polishes once and then forget about them. For my first post I chose OPI Ate Berries in the Canaries from the Fall 2009 Spain collection. This is two coats with G & G HK Girl top coat. Ate Berries in the Canaries is easy to apply and is opaque on two coats. This is pink-ish purple-ish berry-ish I dunno what color creme. Very pretty on it’s own and definitely deserved to get out of the Helmer again. On my first post of the day I have yesterday’s Lynnderella manicure undies for you. This is Innie Minnie Mightie Bow from the Couture de Minnie collection. This is packed with gorgeous shimmer and all I can say is that OPI really does these classic reds better than anyone. Just perfection! This is two coats of Innie Minnie Mighty Bow with G & G HK Girl top coat. Application was smooth and perfect. This was almost a one coater for my nails too. Innie Minnie Mighty Bow is a perfect shimmery red. Another day, another blog post :D This is OPI Chic From Ears To Tail, a very pretty bubblegum pink with a subtle silver shimmer. It’s from OPI Couture De Minnie collection of five polishes. Not really all that unique but very pretty either way. This is three thin coats of Chic From Ears To Tail with G & G HK Girl top coat. Chic From Ears To Tail was a little streaky to apply on the first coat and it took three careful coats to be smooth and opaque. This is a very summer-y girly shade that is great to wear alone and it also makes a good base for nail art or layering glitters. 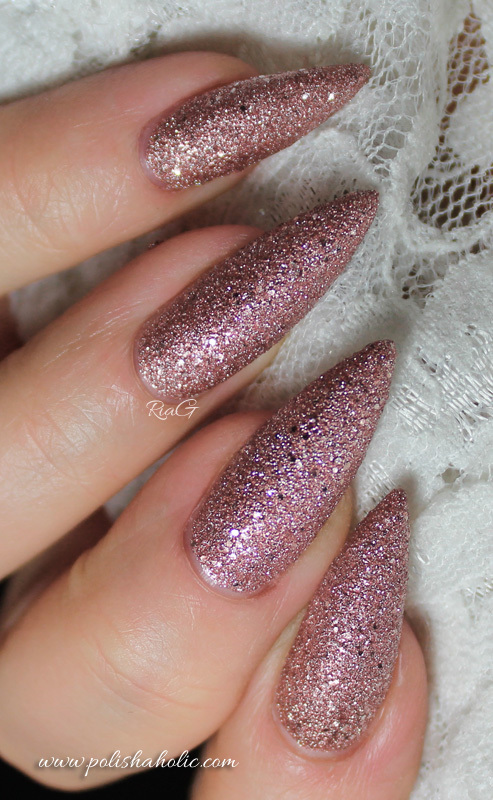 Later today I’ll show you another new Jindie Nails glitter topper layered over this pretty pink thing. So check back for that! I bought this polish along with the whole collection from Glisten & Glow’s online store. If you haven’t tried their Stuck On Blu base coat or the amazing HK Girl top coat be sure to correct that mistake soon enough ;) I promise you won’t be disappointed! ***All products used on this manicure were purchased by me. Hello again! Here’s, as promised, my second post of the day. The awesome Gini from Sassypaints has come up with an idea of “Try it on Tuesday”. “If you have a blog and you want to create a post do it, if you can’t that week but still want to participate that’s ok too! YOU DO NOT HAVE TO HAVE A BLOG! Post it on your Facebook fan page, IG account, Tumblr, Twitter, or personal Facebook, anywhere you wish! EVERYONE is welcome to join in! I want to interact with my followers, not only with my fellow bloggers but with ALL of my fellow polish lovers! Then I will post all of the photos that were emailed to me that day, along with their links, in this photo album on my Facebook page! So my first untried is OPI You Only Live Twice. This is three thin coats with G & G HK Girl top coat. 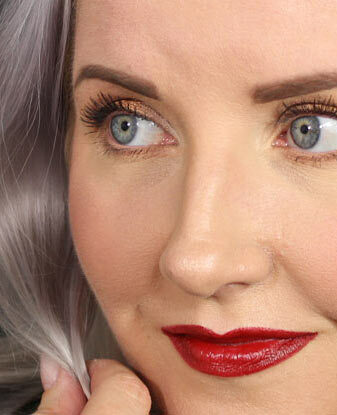 I can’t believe this stunning red was sitting in my drawer untried. So pretty and sparkly! Application was good and my long nails needed three thin coats for an opaque result. Shorter nails can get away with two.